They have gained their popularity because of the easiness of use, reusability, durability and discreteness. Micro Rings are safe, secure, durable and perfectly allergy free. There are no glue, no heat, no chemicals and no damage at all! 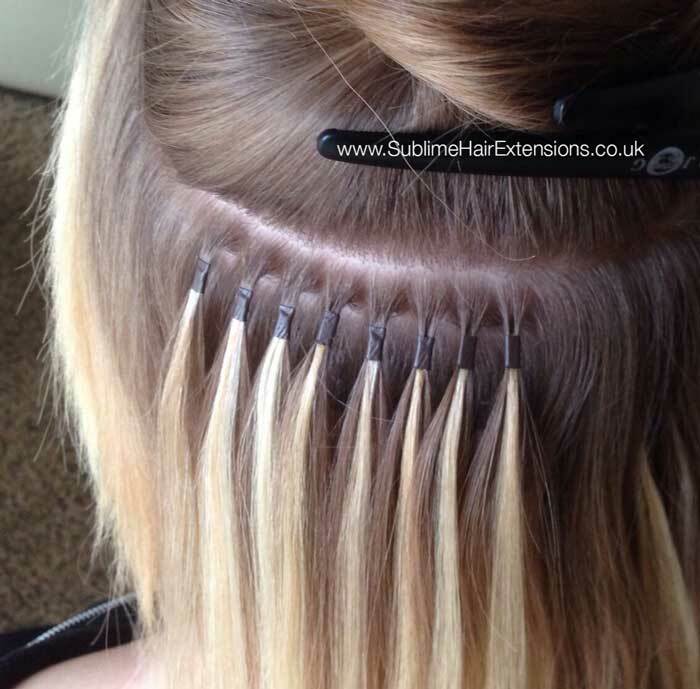 Micro Ring Hair Extensions Technique uses small metal tubes to secure the extensions. Those tubes are usually made of aluminium or copper. The aluminium was popular in 1980-1990, but now the copper is the king. The copper is better that aluminium because the copper does not break. All the modern rings have an anti-allergenic coating. They are safe and secure. They can last for long months and withstand washing, dry blowing and bleaching. Today, they come in many sizes ranging from about 1.5mm to 6mm. Different inner linings exist to suit different customers. Some Rings come with silicone rubber lining to avoid the slippage. The size choice is important for the natural appearance, the comfort, and the ease of wear. The rings can be of different thickness, length and profile. The best ones are the very thiny, with one enlarged (funnel like) end. The Micro Rings come in different sizes and colours. They are small enough so they are invisible when properly fitted. When correctly clamped, they are thin impossible to spot. Micro Rings fitting does not need heat or chemicals. Glue In techniques (like Nail-Tip or Cold Keratin) require a glue to be applied. Fusion Keratin technique requires the use of heat. The glue and the heat will damage your natural hair and scalp. The use of strong chemicals for Keratin removal or heat will be needed to remove Keratin Fusions, this could create further damage and provoke allergies. Weaves and braids are applied with some tension and their removal can be a very damaging process. Micro Rings are applied mechanically, absolutely without any harm. They are made of copper with anti-allergy coating. The maintenance and removal are easy and can be done at any moment, without chemicals or heat. If you wish to add some more volume or length, you can easily get some strands added. You can safely style, blow dry, colour or dye. They are neutral and durable. You can use your them for long or short periods of time and they can be easily removed and put back at a relatively low cost. To maintain the glued in your technician will need to remove all the Keratin Fusion glue from your hair prior to re-fit the strands back. The sewn in or weaves are delicate to maintain and re-use of the extensions is limited due to the mechanical damage during the removal process. Keratin Fusion requires heating and the stands could not be re-used several times as well. Micro rings are easy to remove and put back. They are simply squeezed one by one, carefully removed without damaging your natural hair and your extensions can be re-fitted again. This makes the maintenance less expensive, especially when you use Russian Hair which can last several months, and even for up to one year with appropriate Aftercare. Ask us for advice. Some extension techniques such weaves or braids require that you must have hair long enough and with some consistence. This limits the use for people with short or relatively thin hair. Braids and weaves cannot be applied to short lengths and thin hair will be damaged by tension and will break under tension during the extensions application. Micro Rings are safe and are suitable for people with relatively thin or short hair. We often help people with thin hair adding considerable length and volume. People with short hair can have their extensions done, provided the minimum length of natural hair is at least 3-4 inch long. Basically, the natural hair needs to be long enough to just cover the micro rings that are fitted few millimetres away from the scalp, which would be impossible with Weaves or Braids. Most of extensions are visible to external eye because adding some thickness by the roots. Only glue in Keratin Fusion extensions challenge the micro rings in discretion and invisibility. Weaves and braids add thick tresses and are aesthetically unappealing. Micro rings are perfectly flat, discrete and invisible. They are securely fixed just few millimetres from your scalp and if regularly re-fitted every 3-4 months, will stay invisible for everyone. Always perfectly colour matched to your extensions colour and even with a very close look still hard to spot. Keratin Glued or sewn in extensions, weaves, braids and keratin can hardly be re-positioned without complicated and sometimes dangerous for removal procedures. The use of chemicals, heat or complete new sewing are often necessary for other kinds of extensions (example – Keratin). Micro Rings are easy to adjust, re-position or remove them completely. They just need to be slightly de-flattened and your individual strands are ready to be moved up, adjusted or replaced. During the re-fitting (or redo) session all the Rings are replaced with new ones, ready to serve for the next 3-4 months. If your hair is of high quality, your strands can be reused several times.